weapons and land totaling 31.300 8.200 including the Tank. Has a 1.900 air force war machine, and also as many as 760 naval war machine. and even more frightening than China, is the average age of people there who entered the military is capable of 20 million each year. 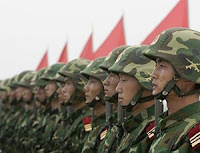 until now China (PLA) has never lost a war, the Korean War, China against the United States ended balanced. Actually, besides the above three countries, there are two categories of countries that enter the country again with a great army, namely India and Indonesia. Yep, India great country with a population of 500 million people is a growing economic power and military strength is offset by an increase in all, India is only involved in its history of war with Pakistan and China ended defeated and a draw .. while Indonesia is a large country that is "castrated", Indonesia has amazing potential, and foreigners know it. with a population of 250 million, abundant natural resources, Morale is high it is appropriate that the Indonesian military into account. Indonesia now ranks 18 (Down 5 ratings since 2010) military world and number one in Southeast Asia, far behind neighboring countries, especially Australia .. and one of the most feared military in Indonesia is KOPASSUS, entered ranked third best in the world of special forces version of the Discovery Channel.